I have some great news about the pavilion project: we have no debt! Thanks to Bob’s walk and a very generous donor we were able to pay off the last $100,000 of debt this fall. 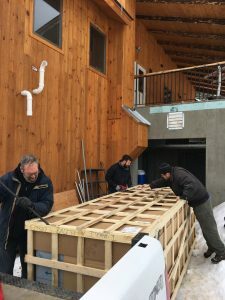 That allows us to focus resources directly toward program again and also start working toward the miscellaneous parts of the pavilion project we decided to phase to save money and time during the initial construction. Those remaining parts include a climbing wall, air exchangers, kitchen equipment and a wood boiler. The wood boiler is our focus right now. Why a wood boiler? It can provide zero-dollar and net-zero emissions heat! Here in Plymouth, VT winters are cold! We also have lots of trees on the property. One of our foresters estimates we could cut 70 cords per year at a sustainable rate (in other words, the forest grows that much new wood each year). We estimate we will use 15 to 20 cords total for fireside cooking, other camp fires and heat. If volunteers continue to cut wood as they have for many years we can provide all the fuel needed to heat the entire facility for almost zero dollars (we’ll have to buy diesel for the tractor and gas for the chainsaws of course). Utilizing plumbers, engineers and the latest trends in the wood burning industry we have designed a central boiler system that will heat the pavilion, cabin and a third building of our choosing at about 85% efficiency. By comparison, many wood heating systems operate from 50-70% efficiency. Not only will this system be very efficient when it’s operating, the wood we’ll burn will take very little energy to process (from tree to fire will take only two handlings, very little transportation and fossil fuel). On top of that we will be able to gently harvest the trees in our forest that are dying or in poor health meaning we get to use the carbon stored in the tree just before it dies and that carbon gets released anyway. In short, our process for burning wood can be considered carbon-neutral or net zero. If you can’t tell, I’m very excited about this (and totally geeking out… sorry if you’re bored). For those of you who are excited with me, please consider giving toward this project. Our estimated cost for the infrastructure including foundation, shed, underground pipes to pavilion, boiler etc., utilizing a lot of volunteers, is $50,000. It would cost additional to install in the cabin and a third building. Any donated materials make this number smaller of course. Heating the pavilion with wood will save us about $7000 per year assuming propane price of $1.60. As prices rise and/or we heat more spaces our savings will grow. That means a pay back on the system of less than 7 years. Please consider making a gift toward this important project. At time of writing $10,717 has been given toward the project. You could make a one time gift, or, perhaps you would consider making a monthly contribution for a year or two years. If 55 people would give $30 per month for two years, the project would be paid for! Consider it one way you can help the environment and young people at the same time. 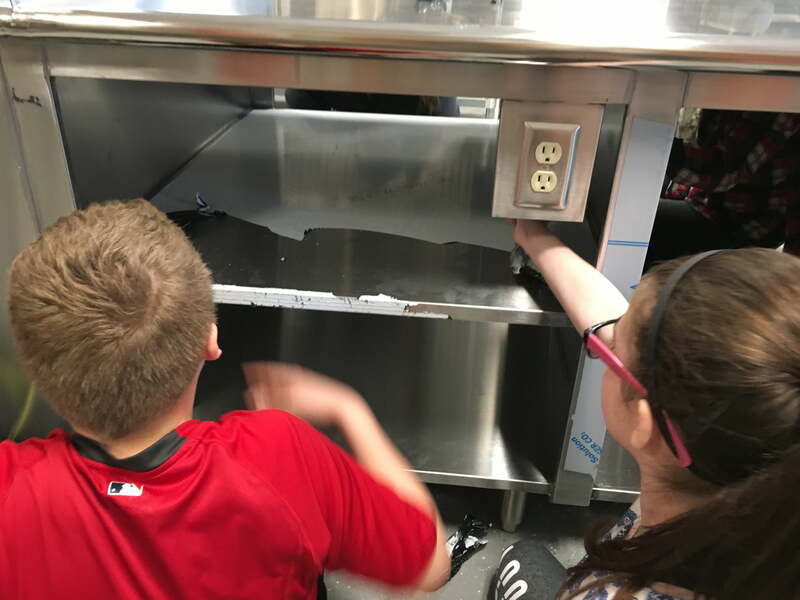 This past summer a camp supporter, Yogi, noted that the kitchen was not near complete. He asked me what one of the next steps was to finish it. A week later, a friend of his and camp supporter, Mark, asked him what else was needed at camp on the pavilion project. Yogi told him quite simply, a stainless steel table. This wasn’t just any table, as you’ll see in the photos below. It took design and special manufacturing and would be expensive! The table was envisioned especially to help with the famous BBC fire side cooking. This table is the backbone of the crate packing and storage process. To make a long story short, Mark mentioned the mini project to one of his friends Wil. Together they paid for the table and got the project under way. 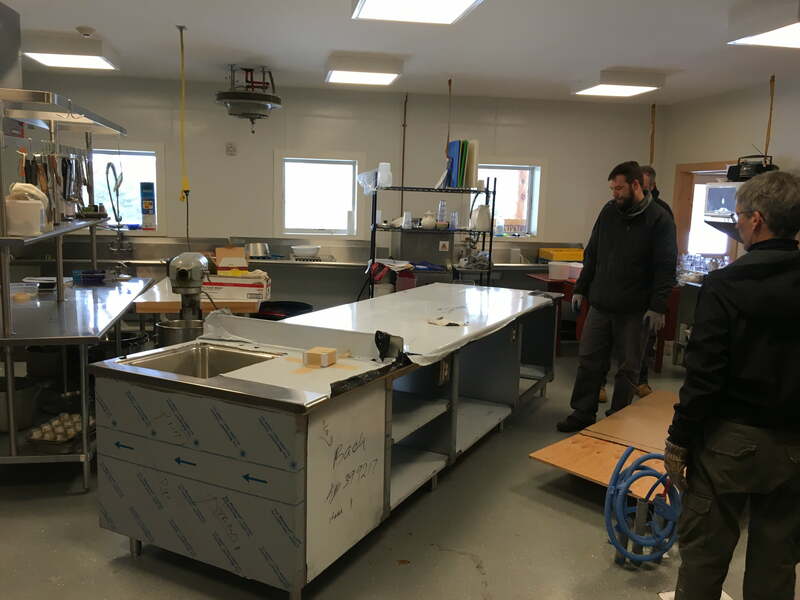 Today, during Lynx Winter Camp, the good folks over at Steiger Supply North dropped the table off and helped to set it in place. Campers even pitched in to peel off the annoying protective tape. For me, this web of people making this small project happen in cooperation and team work is a vision of the community of God. Fall Newsletter: What’s up with the Pavilion Project? We are fortunate to be operating completely out of the new pavilion! We gained occupancy to the entire building June 2016. We had partial occupancy June 2015. We are focused on finishing this project! That includes finishing moving in, some additional fundraising and completion of a few items. Moving in is the easy part! Total cash needs to finish the project and pay down outstanding debt is $249,500. $116,000 of this is debt on which we are paying interest. We are working to get rid of this debt (you could make a contribution now… or buy a session of camp for your child for Christmas)! The remaining $133,500 is to finish aspects of the project. Those aspects include kitchen equipment, climbing wall/high ropes, wood boiler, finishes (paint, sealing floor etc). 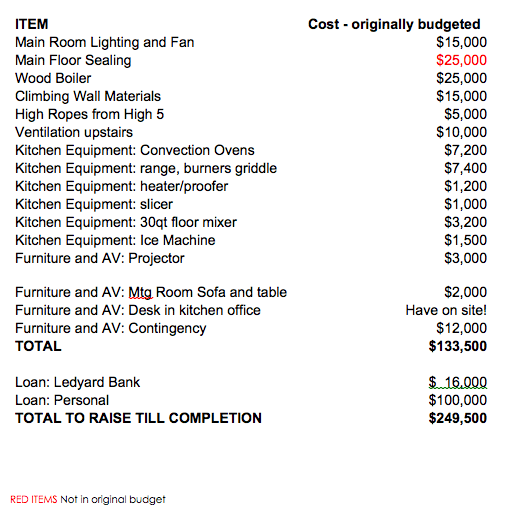 Find the detailed list and estimated costs at the bottom of this post. 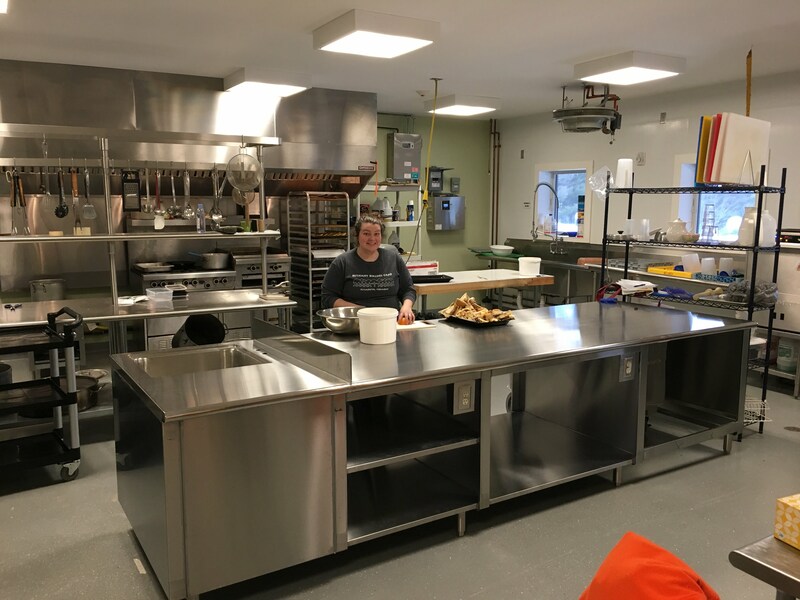 To date we have spent a little over $1,800,000 on the building including the loans referenced above, some in-kind gifts of materials and almost 7,000 volunteer hours. We expect to complete the project and all its components as time and money allow. We expect to finish paying down debt by end of calendar year 2017. And we expect many great uses of the building from now on! The building has served campers for two summer camp seasons and this winter will be the second winter camp season hosted in the new building. There have been 5 weddings and many other group uses already in the short time the building has existed. If you would like to give to help finish this project, PLEASE let me know. Pavilion Progress Continues – Can you help?! Work on the pavilion continues! We hope to have the 2nd floor of the pavilion completed and usable by April of 2016. The 2nd floor includes office space, a large meeting room, the nurses station, etc. We’re hoping to utilize as much volunteer labor as possible. Can you help? See the details below and write to amber@bethanybirches.org or call the camp office at 802-672-5220 to let us know if you can help! Join us on Saturday, Dec 12. The work will start at 9am with lunch at noon and continue until 3ish. Snacks, coffee and treats available throughout the day. All work will be inside! Come for all of the day or come for an hour but PLEASE LET US KNOW IF YOU CAN COME. This will help Phil Wilkerson plan what work can be done. 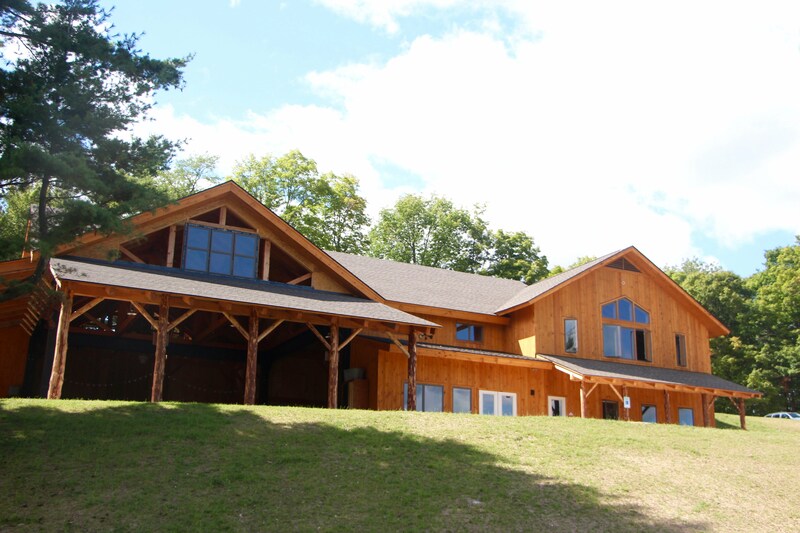 Contact amber@bethanybirches.org or call the camp office 802-672-5220 to let us know you plan to join. If you can’t come on the 12th keep your eyes pealed for the next pavi work day in early January. If you’ve got a couple days you’d like to give or a group of people who’d like to help let us know. There is plenty to do in the hopes we can have the top floor finished by April. This week has been stressful! We had an electrical inspection on Monday (passed). Building inspection on Tuesday (allowed access to a couple areas). We are still needing a visit from the health department. And, on top of that, staff are showing up. In fact, summer staff orientation starts on Saturday! In the building lots of progress has happened. Wall finishes are going on. Fire alarm has been completed. The kitchen is almost entirely set up (and is now being clean). Final grading and seeding has happened everywhere. Porch railings are being installed. The boiler is supposed to come on line Friday. And yet, there is still lots to do. Some lighting fixtures have to be installed and there is plenty of finish carpentry to do. And of course after that, the upstairs has to be finished, chimney installed, big garage doors and wood boiler installed, climbing wall built and some other things. But, we are headed toward completion on phase 1 and that feels good. Check out the latest photos. It’s been a busy week at BBC! The work didn’t take a Memorial Day Holiday – instead Dale Snader of Dale’s Homes led a group from Taftsville Mennonite Chapel to rake and seed the property. Grass is already starting to grow. Another electrical crew from PA arrived to make sure we have lights, electric and meet the fire codes. Thanks to Harold Bergey, Will Bergey, Robert Frederick and Andy Bird for giving their time! 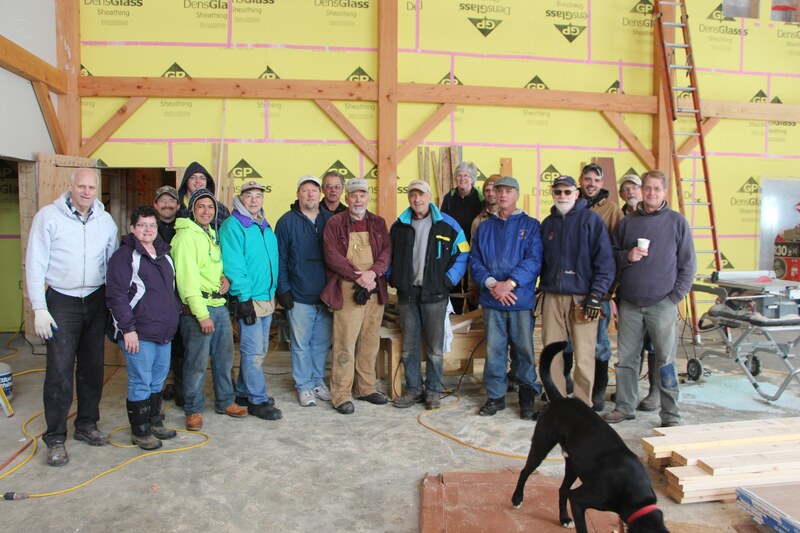 Larry Derstine, Ken Hershey and Roy Snell volunteered alongside the crew of Jenne Construction to keep going on the finishing touches including putting doors in the mudroom! 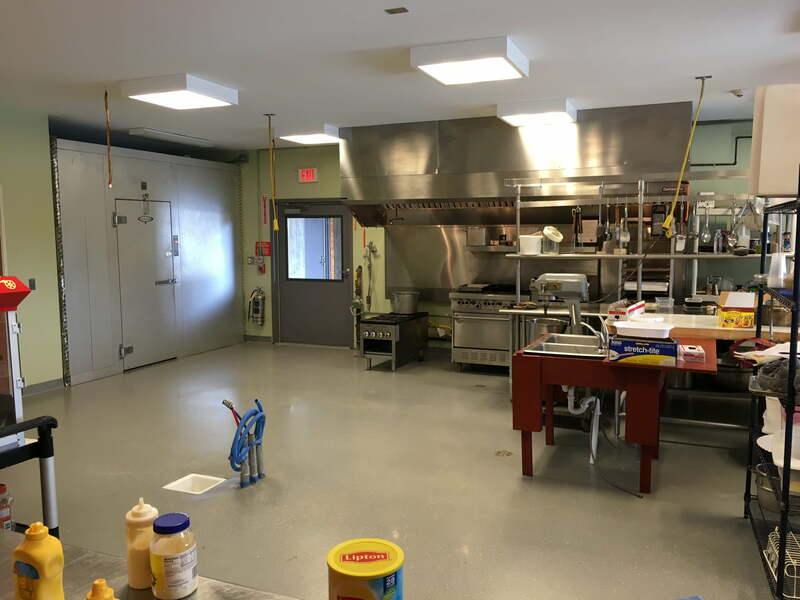 Vermont Protective Coatings sealed the kitchen floor and Joanne, Scott and others kept the painting process moving. Martin Excavating was here smoothing out the East Side Bank and dumping stone around the pavilion. The most exciting part of the week – putting the bell in it’s new home!! The week is winding down now. Make It Rain is on site for the weekend. Our fearless leader, Greg Jenne is leading them. Some neighbors and members of Bethany Mennonite Church came out for the morning. 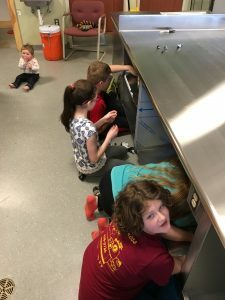 Earlier in the week, a volunteer group from Franconia Mennonite Church came. And they made progress! Sheet rock was hung, taped and mud. Siding and roofing continued. Underground electric continued. We are pushing hard to get in before summer. Will you come help? The week is shaping up to be a great week for pavi progress! Martin Excavating is scheduled to return to begin the final grading so keep your eye out for large machines back on the hill! Bill Derstine, Ralph Leatherman & Rich Leatherman (all of the Southeastern PA area) are joining Harold Bergey and Andy Bird to keep going on the rough wiring and service hook up. Inside the building you’ll also find drywalling in the kitchen continuing by the crew of Jenne Construction and PEW Builders. The large trench you can see off the front right corner of the building is thanks to Dale Snader of Dale’s homes who came up last week to do some digging for the electrical hook up. 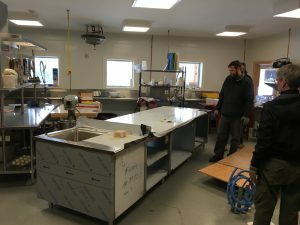 If the pavi cam could pan the rest of the camp you’d see there is much clean up and work to do before summer which starts in less than 2 months! Can you come help us get ready for summer? What a month! The pavi has been transformed from a partly finished shell to an almost summer-ready building…well, parts of it. Progress could not be made without the help of so many volunteers! People have come from far (PA) and close (Lynds Hill Road) to help get the pavi ready for Summer 2015. 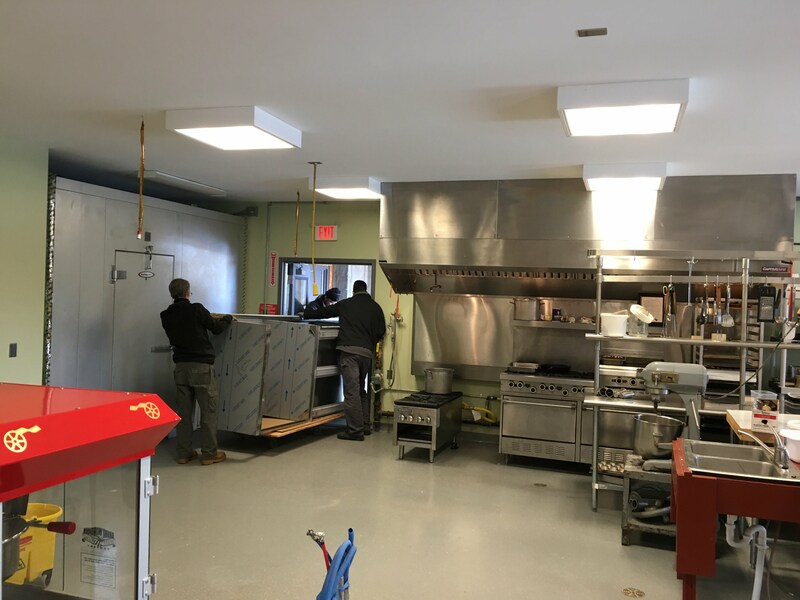 Progress also could not be made without the daily efforts of the Jenne Construction Crew. 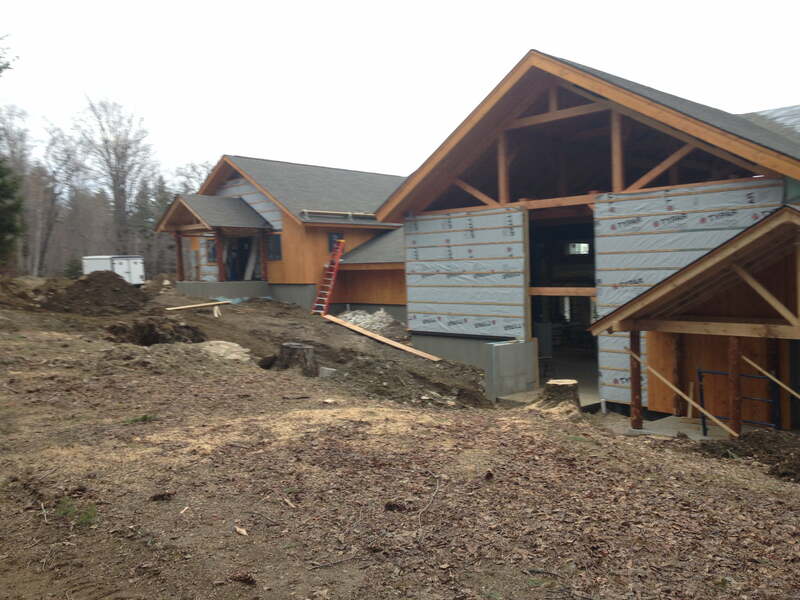 We’re thankful they braved the mud season & cold spring temps to keep moving the pavilion closer to finished! Despite all the progress that’s been made during the month of April there remains quite a ways to go! Do you have anytime during the month of May to join us in getting the pavilion ready for summer? Email us or call the office to let us know when you can come. If you can’t come to help in May be sure to join us this summer! Bring a camper or come volunteer! Read on for a recap of pavi work throughout the last month. Click the link to see Pavilion Progress Pics and the people who have been doing the work. Another exciting week at BBC! A group of 13 are here from Salford Mennonite Church (Harleysville, PA). 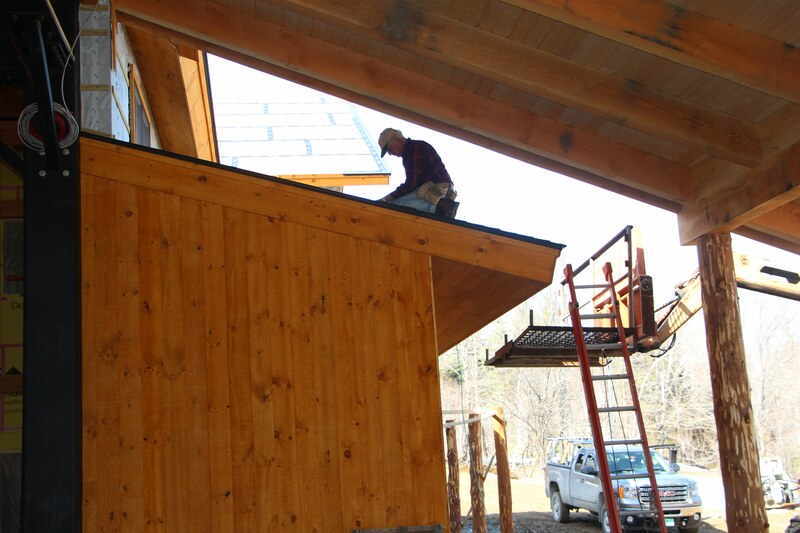 In one day (Tues) they’ve put decking on the porch roofs, started shingling, aided Harold Bergey with the electrical progress in the kitchen and continue to prepare the downstairs for insulation and sheet rock. 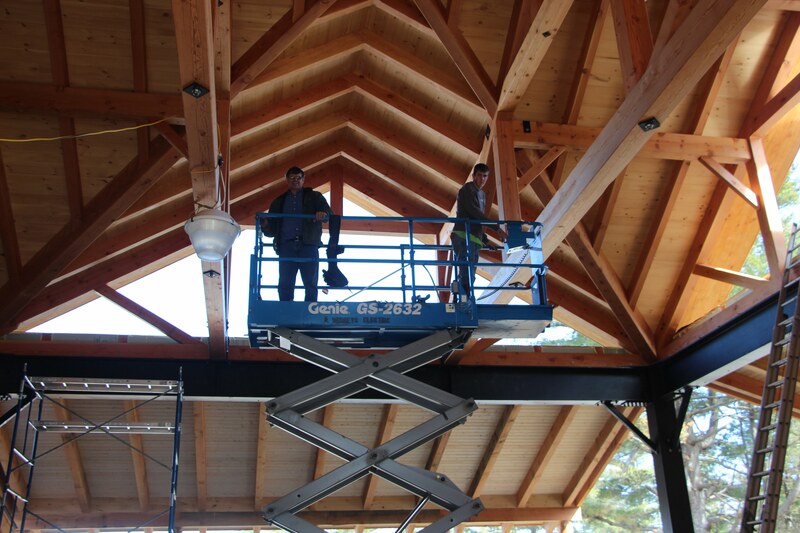 The crew of Jenne Construction continues to steadily move the pavilion towards completion. Pray for good roofing weather this week as many hands make the work light! There continues to be lots of action on the hill this week to move the pavilion towards a certificate of occupancy by June 1! Inside the building a team of electricians are finishing up the rough wiring and spending time on a lift to prepare the high pavi ceilings for lights. Many thanks to Harold Bergey who’s here for the third straight week and his posse of volunteers: Will Bergey, Marlin Bergey and Neil Bergey from Bergey’s Electric (Hatfield, PA). Andy Bird (Bridgewater, VT) has been volunteering his VT Masters license all week too! Roy Snell (Woodstock, VT) Ken Hershey and Larry Derstine (Bridgewater, VT) have spent 2 days shingling and siding. Nancy and Russell Pejouhy and Jeremy Ebersole (Tafstville, VT) have spent time staining interior boards. RFactor is here spraying insulation downstairs. On Tuesday Nevin and Job Mast (Oley, PA) spent the day installing piping for a central vac. Audie Bellimer (Bridgewater, VT) is making sure propane is ready to be used in the kitchen. 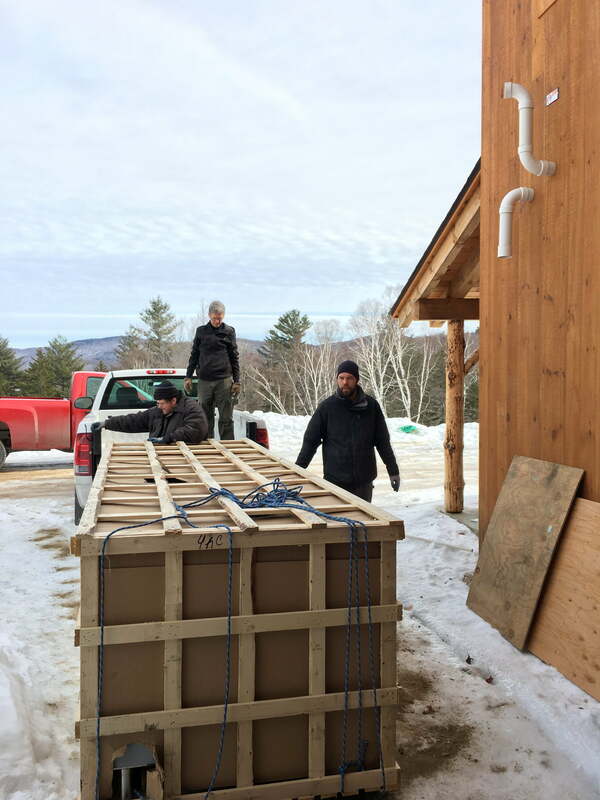 Jon Blanch (Wallingford, VT) continues to spearhead the heating efforts. 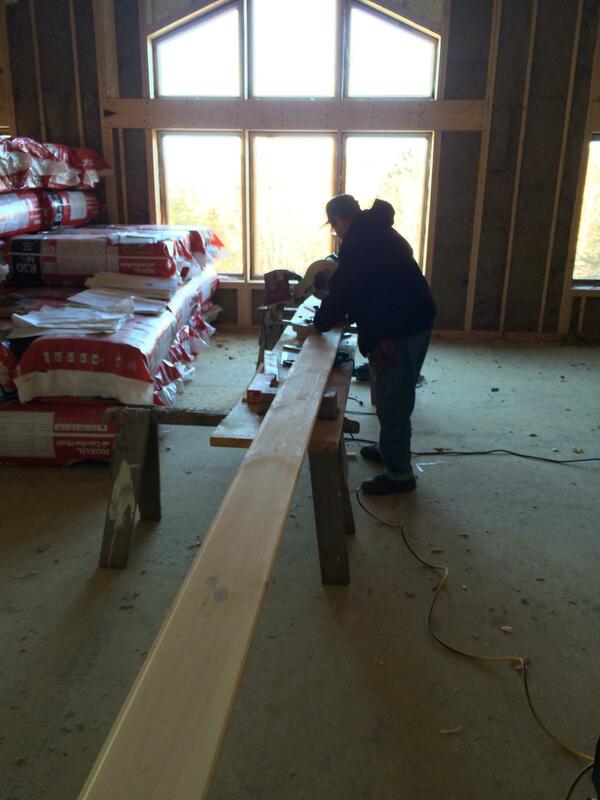 And the crew of Jenne Construction steadily contributes to pavi progress each day! Today marks 6 weeks exactly until we would like to gain conditional occupancy and start moving into the new pavilion. In some ways, that seems like a long time. But it’s not! There is much to be done before that point. If you’re able to give some time (or $$$) between now and June 1, please do! This week a group of 10 guys from Blooming Glen Mennonite Church is volunteering. R-Factor insulation experts are on site doing spray foam. Jenne Construction is here, of course. Local volunteers (Betsy Tonkin, Marcia Bender, Calef Hepler, Naomi Moyer, Joanne Hershey and others) are staining board after board. Porches are being finished and then siding will continue with help from Ken Hershey, Roy Snell and Larry Derstine. Roofing will continue as weather allows (it snowed some today, April 20). Electrical rough in is nearly done and finishes are starting. Pray with us for ongoing safety and good times. Harold Bergey is back to work with Andy Bird on underground electrical needs. Dale Snader of Dale’s homes donates time and machines to dig trenches. 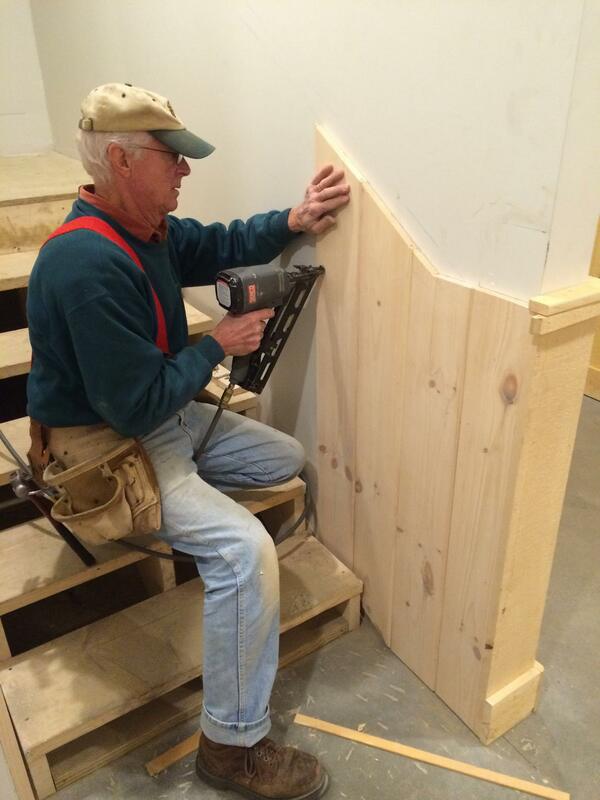 Ken Hershey and Larry Derstine contribute their carpentry expertise to every aspect of the building. John Blanch continues to move the heating work towards completion. 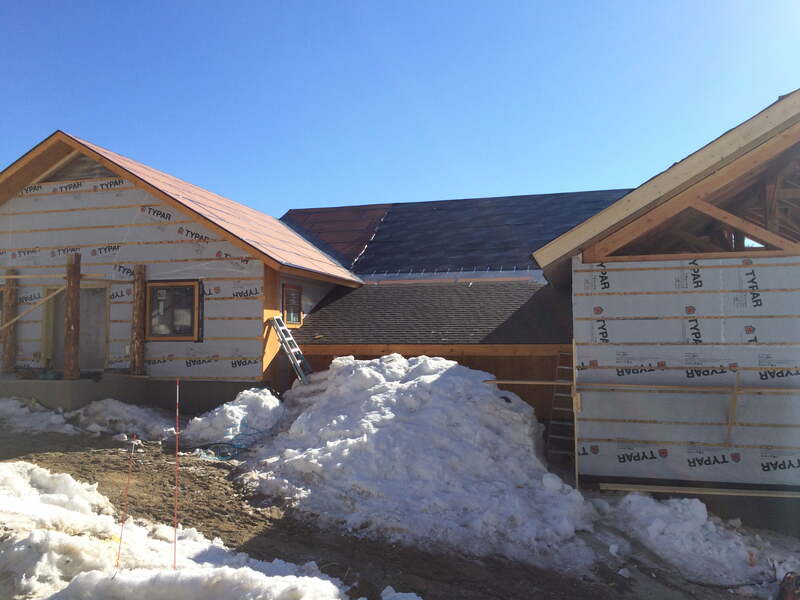 Jenne Construction completes the shingling on the 2 story part while making headway on drywalling the kitchen. Tuna, Greg and Robert discuss phasing with the fire marshall in an effort to gain conditional occupancy by June 1. 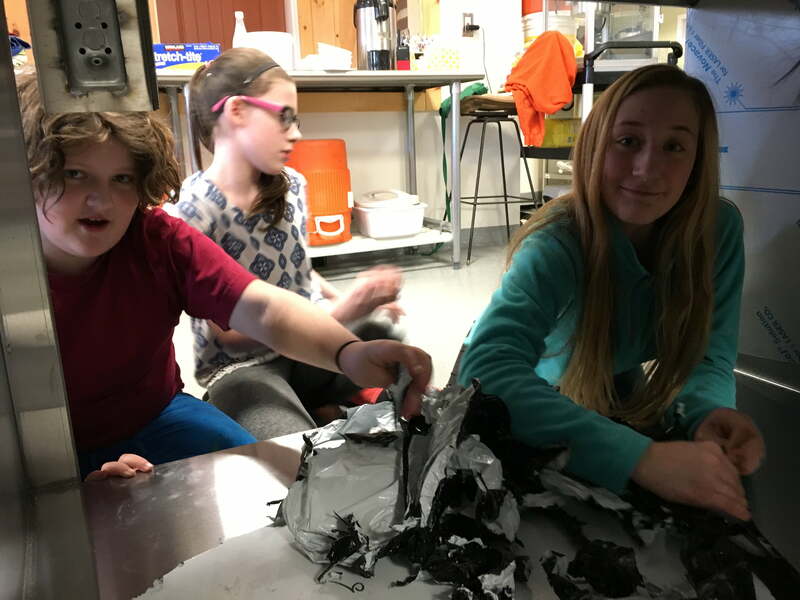 Come join us and be part of the May Update! 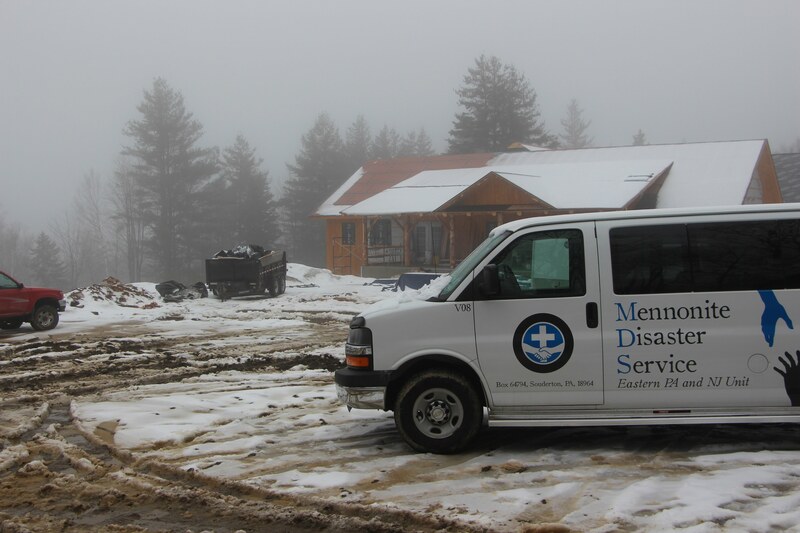 The Mennonite Disaster Service (MDS) van could be seen in the camp parking lot from April 6-10. Each spring a group of volunteers from Salford Mennonite Church travel in this van to an area that has experienced a natural disaster. The group serves for a week by doing whatever needs to be done to minimize the physical effects of the disaster. This spring there wasn’t an option to head towards a natural disaster on the East Coast so they drove the van to BBC! …Attempting to build a large building from start to finish in VT during the months of Sept – June is a bit disastrous…Utilizing as many volunteers as possible to build a commercial building has the potential to be a scheduling disaster…Going 50+ days below freezing when attempting to complete outside construction work feels like a disaster to each worker who can’t feel their fingers/toes most of the day…A spring thaw turning the parking lot into a huge mudpit has the feel of disaster. The Salford MDS crew did what most MDS crews do. They brought encouragement in the face of discouraging facts. They smiled as they climbed ladders to shingle the roof. They shrugged off the April snow that pushed them to insulate inside. They asked questions about the mission of BBC and worked all the harder. When they finished on Friday the building had more siding, shingles and insulation. The van pulled out early Saturday morning. The parking lot was still muddy. Much of the building is left to be finished. There still isn’t enough money in the bank. On Monday Ken Hershey, Larry Derstine (Bridgewater, VT), Roy Snell (Woodstock, VT) volunteered time to continue working on shingling and siding. Andy Bird (Bridgewater, VT), Harold Bergey, Will Bergey, Marlin and Neil Bergey (Hatfield, PA) are volunteering all week to continue the rough in electrical work. 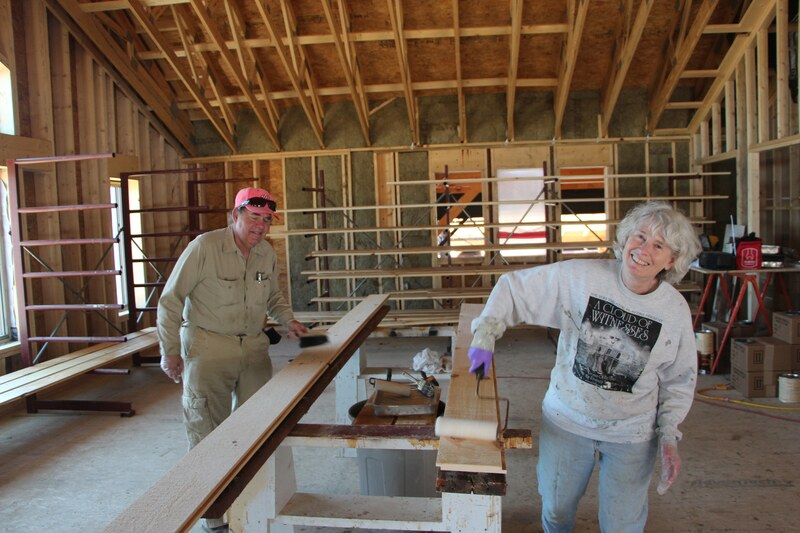 Today Russell and Nancy Pejouhy (Bethel, VT) came to stain interior boards. Margaret (Lebanon, NH) is here keeping the office in order. A group from Make it Rain will be here this weekend to volunteer their skills and on Sunday a group from Blooming Glen Mennonite Church will start a week of service. 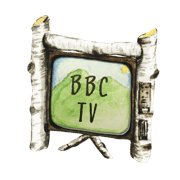 At BBC we normally experience God using people to bring encouragement in the face of discouraging circumstances all summer and this year, all winter. Experience first hand how God does this by volunteering time or giving money to help build the pavilion or sending a kid to BBC this summer! Marlin and Neil of Bergey’s Electric Volunteer to do the high ceiling work. Nancy (OSO) and Russell (OWO) volunteer to stain.